Computers may have some issues during their lifespans. There will be errors, driver issues and more. Some of these issues are resolvable. Some may be more difficult to find a solution to. When the 80070057 error is seen, it is very confusing and misguiding because there are so many variations for it. The code changes and causes some misunderstanding. Here is how you can identify and address the 80070057 error. Read on for more information. A cause of the first two version of the 80070057 error is using constant names for FileSystemObject values. If it happens the VBScript does not understand “For Reading”. As a result, command produces this message indicating an error upon return. To stop this error, place the number 1 as the constant value for OpenTextFile ForReading method. Use the number 2 as the constant value for ForWriting. Use the number 8 as the constant value for ForAppending. This happens when an ADSI code does not have a correct value. For example, when the user name is left out of a user query this can happen. This means that several (or one) argument(s) are not valid. This version happens when asOpenScema is used but does not include ADOVBS.INC. This means the parameter isn’t correct. The previously mentioned errors complex versions that are a result of the 80070057 error. Here are some far more simple version and their fixes. Update the computer system to R10P. Uninstall Quick Books (QB). Then reinstall QB. Finally, update QB on your system. 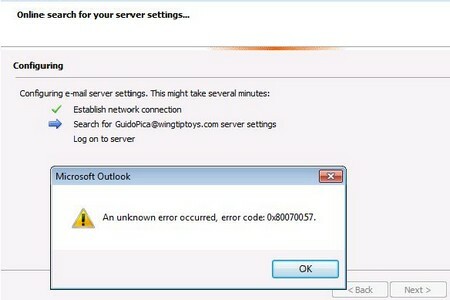 This software has numerous 80070057 errors happening. Reboot the server and change the user info. Some QB services (QB DB17) will begin or function the user information is not valid. Change the QB password ‘qbdataserviceuser17’ then make it sync to the password with the appropriate QuickBooksDB17 user. Use the local admin account to update QB. Only the admin will be allowed to execute the update run. Remove any firewalls from your computer system. If there are having any reservations about troubleshooting and resolving your own technical issues, then feel free to call in some professional technical support. Of course this way will cost you more money than if you determined the issues yourself and resolved it. But, depending on how important this issue is for you, you can sacrifice to get your OS back on the right track.